In the not-too-distant future of Super Sad True Love Story, credit ratings and fuckability index scores are the measure of our worth; America is at war with Venezuela; books are artifacts from an ancient world; and what is know as “Media” is in the hands of people like Amy Greenberg, whose “Muffintop Hour” broadcasts her thoughts on her weight to a waiting world. And those are the positive aspects of Gary Shteyngart‘s dystopia. 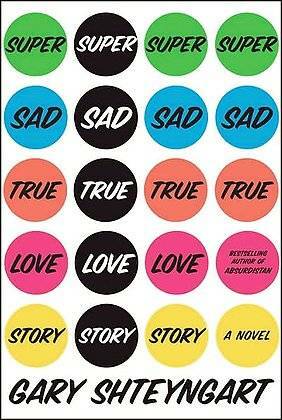 Super Sad True Love Story follows The Russian Debutante’s Handbook and Absurdistan, both of which won awards and accolades and placed Shteyngart on the New Yorker‘s list of “20 under 40” (authors to watch). Bittersweet and funny, Super Sad True Love Story is indeed a love story, between 39-year-old Lenny Abramov and 24-year-old Eunice Park. Both are offspring of immigrants but otherwise they are from different worlds; among other things, Super Sad True Love Story takes a rueful look at the gap between people that technology is steadily and swiftly widening. 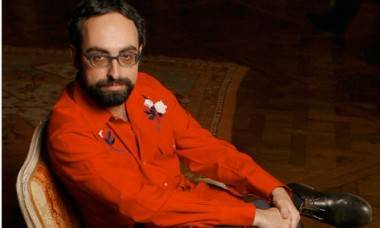 We talked to Shteyngart in downtown Vancouver, the morning after a reading/interview with the author at the Norman Rothstein Theatre Nov 21. Shawn Conner: What went into the making of the trailer? It’s really helpful. My audience, especially for hardcovers – in America, 70 per cent of readers are women of a certain age. So I’m desperately trying to get young people to read this book. I don’t care what I have to do. Having James Franco in a YouTube video helps. He’s the one younger people know. For the older generation, we have Jay McInerney. And Jeffrey Eugenides and Mary Gaitskill as well. These days if you’re a writer you also have to be a full-time media artist. We’re kind of a sideshow, so you have to make sure you’re out there in some way. SC: It does seem like more women than men read novels. Do you see this at your readings? GS: I still get some men. The last book, Absurdiztan, was very masculine. This one has “love” in the title. I love my audience, but it would be nice if more men read books. But I think men are looking, at least in America, for a more interactive experience where they blow things up. Reading requires a deep act of empathy. You have to enter the mind of another human being and surrender something of yourself. That’s a tough sell for many young men. SC: If you’re going to write about contemporary society, do you have to write about technology? GS: You have to. You have to. There’s no question at all. I came a little late to the party. I had a hotmail account for a very long time. And then I had an intern who helped me discover Facebook and helped me with the iPhone. It took away so much of my life and now – the Internet is a harsh mistress. It’s hard to concentrate. I go upstate a lot in New York, it’s hard for AT&T to reach you there. It’s sort of a second-home community, and there are a lot of older, wealthier people. I’m sitting around a very fine restaurant listening to these 50 or 60-year-old people talking. They should be talking about the beautiful surroundings or their grandchildren or the last book they read. They’re all talking about the next killer app! Everyone is addicted to this stuff. And it’s permeated every level of society. SC: You probably noticed it more for having resisted for so long. GS: Now I just what to get out of it. SC: Why did you decide to write about an older man/younger woman romance? GS: Well, it’s kind of a very old trope, isn’t it? I think what interested me, I read about immigrants quite a bit, and both of these characters are immigrants, children of immigrants that is. What I also wanted to do was have one of them be an immigrant from another planet – the pre-digital planet, which Lenny represents. I think the technology has made the gap so much wider it’s fascinating to me. It’s like trying to breed a giraffe and an elephant. What unites them I think is they come from this dysfunctional immigrant background. But what really is the biggest gap isn’t that Lenny is a nebbish schlub, to use two Yiddish words in a row, but that he is unable to swim in this world. And the other thing I was really worried about while writing this was the state of journalism. In the book, The Amy Greenberg Muffintop Hour” is the major form of information. People talking about themselves. SC: Just by coincidence, before I started reading Super Sad True Love Story I began rereading Catch-22. Is Joseph Heller an influence? GS: I think more so for Absurdistan. For this I would say 1984 in a big way. This entry was posted in interviews and tagged Gary Shteyngart, James Franco. Bookmark the permalink.